Who loves Algebra?! ME!!! cheerfully raising hand. Back in College, Calculus is the most popular and hated subject, those complex numbers doesn't gets its easy way on everybody's comprehension. Many repeatedly fails the subject causing a lot of money and stress. Not everyone learns to love Math; for me, its like a challenge that i had surpass and never wanted to be with the same struggle again. Trigonometry never fails to give me a hard time finding the angles' circular functions. Calculus symbolic expressions doesn't hit me with just one shot of trying to understand and unveil the logic. Algebraic expressions and its variables leaves me confused and frustrated. My thought of never coming back on solving Math problems is impossible. Sooner, there's someone who will ask for my help in getting his homework done. I can visualize one on one tutorial sessions with my son and that means i have to possess mathematical skills to successfully introduce a great working relationship with math. Having the opportunity to receive and review this software means i won't be paying extra for a tutorial service and confidently face the challenge of answering complex math problems with this algebra software that will serve as my son's 24/7 personal math tutor. Algebrator lets students enter their own math problems and then solves them step by step while explaining all the steps. Everything from pre-algebra (simple arithmetics) to College Algebra (including matrices) is covered by the program. 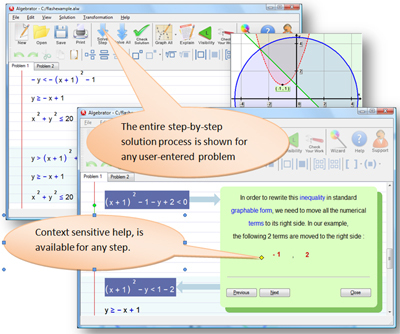 The program is easy to use, all you have to do is enter the problem and Algebrator does the rest! But of course, to have an easy grasp on the subject you must pay very close attention to the detailed explanation or you can practice solving problems and use the "Check your work" tool to know your progress. Talking about one lovely math solution... that's another mommy problem solved! Following you via Friday Friends Connect blog hop. Love babies, I have fourteen grandkids.